We are proud to introduce a way to truly smarten your device! The biggest issue in the market when trying to control a "not-so-smart-device" is not knowing the device's status. This changes today! Instead of just building a pure infrared solution like the other control products out there, we thought we utilize something that almost all those devices have in common: HDMI! We use it to know - and not just assume - the real status of the monitored device. This makes things much more reliable. In order to accomplish that, our developers needed to dive deep into the HDMI code and actually come up with new workflows and smart filtering. Some inventions around that even made it into the latest patent we filed. I hope you will love it! 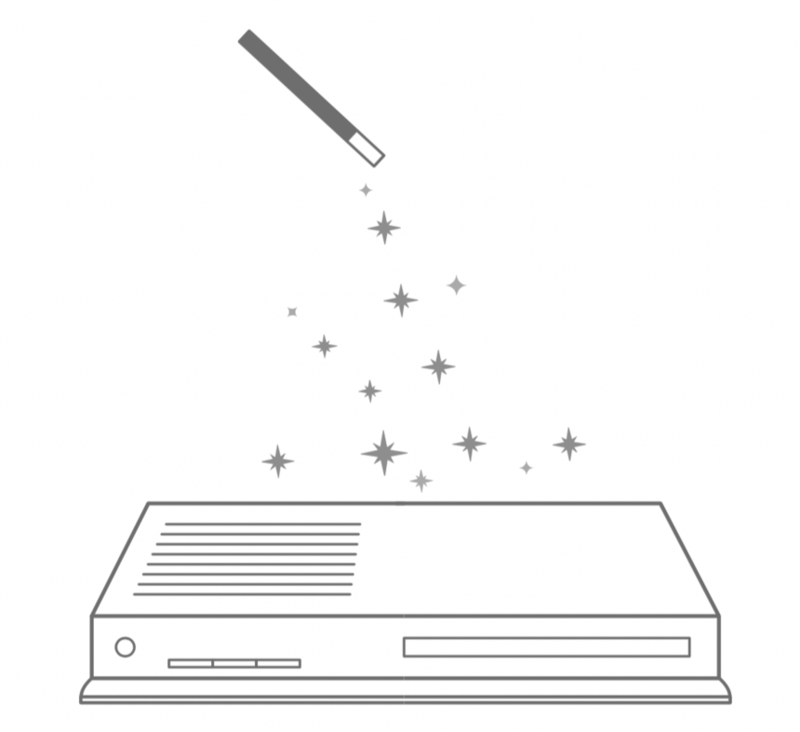 Please note that this magic requires the NEEO Brain to be wired over HDMI to your AV system. Also, not all devices support HDMI CEC and some don’t even have an HDMI port (your old VCR as an example ;-). For those, we introduce the new assumption mode. In this mode, the NEEO Brain assumes in which state your "not-so-smart-device" is and tracks its power status across all recipes and interactions. The assumption mode then assures the so-called "power toggle” command is used in the exact right moments. This assumption mode is also the way to get rid of the power screen and manual interactions that several affected users disliked. NEEO will now handle all of that for you so it feels like a smart device. Additionally - any devices operating in assumption mode has quick access to a “fix" option in case your device should ever be in the wrong state. Don’t worry, if you are in favor of the current handling, you can still choose the “Manual Mode” to continue to use your not-so-smart-devices exactly the way you did up to know. You can switch forth and back between the modes at any point via the device settings. What to do if you already have "not-so-smart” devices on your NEEO? Device Smartener: Have the original remote ready. Open the NEEO App, then navigate to the settings on the top right and open “Device”. Then tap on the "not-so-smart” device and choose “Re-run device smartener”. Follow the instructions on the screen. Assumption Mode: Open the NEEO App, then navigate to the settings on the top right and open “Device”. Then tap on the "not-so-smart” device and choose “Change power mode”, just follow the screen and choose “Assumption Mode”. Your recipes will automatically be adjusted. In case you add a new “not-so-smart-device” it’s even easier, the NEEO setup will guide you through the process. I hope you enjoy that. I’m sure it makes a drastic difference for some of you and I look forward hearing from you. Thanks again for all the feedback you guys have provided. Does my device need to be connected via HDMI only while configuring or always? What if I have more than one stupid device? Michael Grønbech Larsen It does have to stay connected for the "magic". HDMI is like a network, so it doesn't matter if you have multiple not-so-smart-devices connected. If you don't have the option to connect, the Assumption mode will also handle that nicely. Nice - looking forward to try it out :-). I have updated my system, but I don't have a 'Re-run device smartener' for my 'Kiss KMM3010-DK' device. Michael Grønbech Larsen Hello! Does this device support CEC? You should have the option for Assumption mode which also delivers an awesome experience :). Michael Grønbech Larsen This device is classified as an accessory. This is why you are not seeing the assumption mode being offered. What type of device is this exactly? What do you do with it? It is a set stop box used for my TV. I know, you (Neeo) made som changes in the database a while back to make it act like a 'not stupid device', maybe that's the reason? I can't find the old post, but what you did was change the power on function, so that instead of using the power-button, it is turned on by pressing '1'. I would appreciate if that functionality could be disabled again (if the smartener actually works), because I don't want my TV to start at channel 1 every time it is turned on. Michael Grønbech Larsen Thanks for the confirmation :). I have reached out to our IR team and they confirmed the changes have been reverted. Have you updated your device? Yes, I have updated. I have another thread with Andy (https://planet.neeo.com/t/63p99h/missing-re-run-device-smartener) - thank you :-). if i have a stupid device i get the message to connect the brain via Hdmi with the AV Receiver. I have a Denon AVR 6200 a Samsung TV which is connected with Hdmi and other devices which are all connected with hdmi to the Denon Receiver. I which Hdmi port i must connect the Brain ? You can connect the HDMI cable to any open HDMI input on your AVR or Tv. Be sure that the cable you are using is HDMI 1.3 or higher as these cables support CEC. Now the question is, how the cabling has to be done. I have a TV (Samsung) and 4 HDMI Ports. At each of these ports, a device is connected (Apple TV, Bluray player, Nintendo Switch, Nintendo Wii U). Sonos Playbar is connected to the TV. Are there any FAQs, setup guides etc. available? Nicolas Jene I guess if you don't know about stupid devices, you don't have any. Or did NEEO ask you for some devices to manually send the power toggle command? As I just said above, HDMI is a network, so basically it shouldn't matter where you connect the NEEO Brain, just use a free port somewhere on the HDMI Switch or on the TV or on the AVR. Patrick Thanks for replying. I did that, but the outcome is now, that there are blackouts when I use my Apple TV. My setup is now: Samsung TV with 4 HDMIs, NEEO is connected to the first HDMI port, Apple TV to HDMI2, and HDMI3 goes to a PureLink PT-SW-HD41UHD switch, that handles all my Gaming devices (3 Nintendo devices). So if NEEO is now connected on HDMI1, and I am looking a movie on Apple TV 4k (HDMI2), the screen goes black sometimes (not on a regular basis, but quite often). Removing NEEO from the "HDMI network" fixes the issue. Then I decided to add a Google Chromecast Ultra and tried to add it to the NEEO Brain. The app told me that it could not find the device (but told me that have to use HDMI-CEC). Google Chromecast was connecto on HDMI4 of my TV (and not the Purelink switch). Nicolas Jene I have seen many strange cases during the development of our HDMI CEC integration, but screen blackouts when attaching the NEEO Brain was not among them. Would you mind sharing a video of that (if possible with plugging in the NEEO Brain and unplugging it)? Do you have a spare HDMI cable you could test in between the NEEO Brain and the AVR? Hm, I honestly have to check if the ChromeCast-Ultra is supported with the current driver we have. I will let you know as soon as I had a chance to talk to the team. HDMI CEC will sure get further improvements since we are learning from all of your feedback. Patrick I did again a test and now it works. Difference: I installed the latest update that came quickly after the big release. I did a 10 minutes check with the same film and the same cabling and I had no blackouts. Awesome guys, looking forward to test the new software! Does "The Device Smartener" over HDMI also work for devices where NEEO doesn't have explicit CEC support for? Or is CEC something different from "Device Smartener"? Great to hear, many thanks Raphael ! My cable box is a 'dumb' device, so this will be a very nice addition. Just have to find out if my HDMI switch supports CEC, since I'm rapidly running out of ports! Good news. I have a little question, does it works to detect stupid device and support PS4 at the same time if the NEO Brain is connected to my Yamaha receiver ? Off course, my PS4 and my stupid device and the others are connected tu my Yamahe receiver. Does this mean i wont get the “stupid device” Message when applying a recipe? Michael Sørensen if you switch to „Assumption mode“ that screen is forever gone. Have fun! Michael Sørensen Yes and also, when you turn off the reciepe you don’t have to press “leave reaciepe”... using this new mode. Óscar Abilleira Muñiz Correct, no more manual power toggling needed. Neither when using the device smartener or the assumption mode. Aaaaargh. HDMI-CEC is my arch nemesis. I managed to get my NEEO set up just about working by turning OFF HDMI-CEC in everything. My setup includes a PS4 pro, Xbox one X, Apple TV 4k and virgin media TiVo box connected to a Marantz NR1607 connected to an LG OLEDB6. Bottom line - HDMI-CEC didn’t work for me with the PS4 and ATV randomly switching on/off, triggering the tv on/off, switching inputs when I wanted to watch something else etc. The TiVo is the ‘stupid’ device. I’ll try assumption mode first and see if that changes things for the better. Not keen to mess around with HDMI again. Nim Wickramasinghe Also give the smartener a try without enabling HDMI CEC on your devices. All of the devices I have tested personally do pass through HDMI commands even when this is disabled. If not, Assumption Mode should also handle that just fine. Patrick . Happy to report that virgin TiVo box works just fine in assumption mode. Well done! Now awaiting the screen reordering etc, and the ability to update shortcuts without actually starting a recipe would be good too. Nim Wickramasinghe Awesome to hear! Thank you very much for having reported this back. I cant’ plug all the “stupid devices” to brain, but insted using Assumption Mode all it’s works fantastic now. Plugin on the reciepe and the “stupid devices” just power on (I have added a power on step) but the great thing is when you “turn off the reciepe”... the assumption mode makes his work and the stupid devices just power off (before this update I have to press “leave reciepe”.. not now. I only had to change on my tv (after an update of device) “hdmi x (macro) instead hdmi x like it was before. Patrick Now it only remains to get bluetooth remote support (nvidia shield, apple tv or Samgung TV ...) and it will be perfect 😉 Also an update the iphone app to iphone X screens it will be necessary. Óscar Abilleira Muñiz iPhone X App is being worked on and being tested by the beta team already. So that should not be far away. The developer team is growing quickly, Bluetooth is one of the highest priorities. How about the ability to hair have it throw in power on commands wherever since lots of dumb devices have discrete power on and off commands? Tarun Nagpal I am not 100% sure if I got your question right. Right now the commands are being sent over IR for not-so-smart-devices, HDMI CEC is used to check if the device is in the right state. NEEO corrects the state if you are using the Device Smartener based on the info it gets from HDMI CEC. Patrick for dumb devices that you don't know whether they are on or not. There is no harm in sending a POWER ON command before other commands. If it is on, doesn't do anything. If it is off, now it is on. I prefer this method over state tracking since if someone uses a non-NEEO device, they will mess up the tracking. Tarun Nagpal when the device can receive a power on (and off) command then it would not be a ‘not so smart’ device and would it not require any state tracking. Using another remote while being in a recipe with ‘not so smart’ devices will always mess up the recipe and cannot be solved by Neeo (nor by Logitech or any other). BuzzLightyear I don't understand what my explanation didn't make clear. The TV is on or off. Send a power on command regardless each and every time you need the TV. No need to track state or do anything else. Too many remotes tso let you do stuff like this because they want to simplify things. Just let me sequencers power on in every single recipeinvolving that dumb TV or whatever. Tarun Nagpal the point I am making is that a ‘stupid’ device will not have a power on or command. If it has these commands then it is not a ‘stupid’ device. Tarun Nagpal Just to clarify what BuzzLightYear is saying: A device that does not have a discrete Power On command and another discrete Power Off command is a "stupid" or "dumb" device. These devices only have Power TOGGLE commands, which means we cannot send a Power Toggle command before sending any other command. Claudio Guareschi I understand where the confusion starts. All this “stupid device” is based on the assumption that NEEO is mature enough to be the one and only control point ( ie: nothing else can change the power state of devices ). In such a case, devices for which discreet IR codes for powering on and off are provided, can be dealt with as stateful. Unfortunately NEEO is far from being mature enough to allow users to lock away device remotes. On top of that, many devices have their own logic that determines changes to power state, for power saving concerns or to allow waking up ( ie from network ). This means that by design the current integration ( solely based on IR ) is faulty. Any device that is only integrated via IR, be it with a power toggle or discreet power codes should be considered “stupid”, since NEEO has no way to determine the actual state of the device. Quick example: if Power ON is sent but for some reason the device doesn’t get the input or decides to ignore it... NEEO will assume the device is ON. Again.... many devices are open to smart integration, via HDMI CEC, or TCP API etc... it seems like NEEO team is focusing too much on low-value integrations via IR, while the big issue is building an integration that is aware and reliable. There is so much that with IR can’t be done, regardless of state awareness. For instance, setting the amplifier to an absolute volume level is impossible with IR ( only relative steps to increase or decrease ). This is possible with API integration. Ascanio Colonna di Paliano I tend to agree with you that where available CEC or Network API should be the preferred control method as inherently more reliable. At the present state of affairs, though, IR is the minimum common denominator and I believe this is the reason why so much effort is placed into it. A robust IR implementation should make most people happy. Any device supporting discrete commands for its basic functions i.e. ON, OFF, Channel # etc. from the integration point of view does not require NEEO or any other smart remotes to track its state as there is simply not penalty to send, for example, the ON command to an already ON device (the command just is ignored). The problem is completely different for devices without discrete commands and just "toggles" which NEEO chose to call "stupid" or not so smart". Those device are just an integration nightmare as, even if your track their state, the stored state go easily out of sync for the many reasons you pointed out. This is not a NEEO maturity problem but is a problem common to all smart remotes because it is due to the limitations of these "toggle only" devices. Having said that, I believe the solution the NEEO team came up with, of checking the device status via CEC and use power toggle appropriately is just brilliant and in itself better than wha my Logitech remote offers. My suggestion is, if you can, employ devices with discrete commands. In my specific user case, I went as far as building a contraption with an Arduino to read IR codes and discretely control the power stateI of my home theater PC which supported only "toggle" for its power function. After that, I have been very happy with the NEEO flawlessly controlling all the components of my system as all of the controlled devices were now "smart". If you can't have all "smart" devices, using the "smartification" with CEC should be a very good (as in reliable) solution if it works for your specific device. Relying only on the remote remembering the device state should be the last resort as you will have for sure annoying out of sync states you will have to deal with manually. If I understood correctly, Tarun Nagpal and Ascanio Colonna di Paliano are not unhappy about how we handle not-so-smart-devices, its rather about the "smart devices" which do have specific commands for ON and OFF. As far as I have understood it, currently the ON and OFF devices are not sent when relaunching a recipe since NEEO already assumes it is on, but it would basically not matter to send out these commands each time. We will look into this, we will also look into options how to better handle "smart devices", cause basically, you are right, these can also get out of sync when a command is missed. The idea that a device like Neeo will be able to be the single point of control without being able to monitor the real state of the device it controls is (put in friendly terms) naive. Patrick Thank you for mentioning this. I noticed it as well with the new release and indeed it is a problem. NEEO seem to be tracking status of smart devices as well where perhaps it shouldn't or is should be user choice. In my particular situation I have added a Power ON button for some of my devices on the remote screen, as they go to sleep after a period of inactivity, I prefer to use those button rather than powering off everything and rerunning the recipe as my Samsung TV cannot be turned immediately on after being powered off. I have noticed that if a device goes to sleep and NEEO thinks it is still on, pressing the Power On function I added to the remote for that device does not send any IR code. If I add the off function and press it, the off code is sent correctly and afterward, since now NEEO thinks the device is Off, if I use the Power On button the IR code is sent. SO definitely NEEO is tracking the status of smart devices but it should not, or it should be left to the user to decide based on their particular use case. Well, updated the app and the Remote and nothing works? None of my recipies. If pushed it says something is fishy. on the Remote i can activate a recipie, and it writes “looking for unicorns”, and nothing works. Michael Sørensen Right now I would simply recommend doing another reboot of the NEEO Brain. Do you happen to know your NEEO Host number? Then I could have a developer take a look at the log files. I personally don't have access due to data protection guidelines. Patrick hi. Where can i find the host number? Michael Sørensen That can be found in the NEEO App. Since it seems to work now, that is no longer needed. Please do let us know if the problems do happen again. Just for the understanding for everybody else: A reboot did fix the issues. Patrick i did anPatrick was just about texting this:) - yes a reboot did the magic:). Anders Willstedt It would be really great if you could give this a try. We managed to find quite a few issues which were especially happening when an AVR was involved, these have been fixed in this release. It has not only gotten much more reliable but also much quicker. If you are still having trouble, let us know. This could be a very interesting case for a deeper analysis. Patrick I checked yesterday and I still have the same problem with my PS4 even after the last update - it cannot be started or controlled by NEEO. Though, when powering off my system with NEEO the Playstation 4 also turns off, so I guess the HDMI CEC is working somehow with the new smartener. But the rest of my stuff works beautifully now with the new solution - I had two previously dumb devices that now turns on and off as they should. WAF is high again. Anders Willstedt If only the PS4 did not respond to the Controls the right way, i would highly recommend to change the HDMI Cable between PS4 and the rest of the Setup. It can be, that this cable is not made for CEC. I have this PS4 that I have to connect with HDMI. My AppleTV, cable box (Tivo that you don't have in your list of device) and PS4 are connected to my Sony AV receiver all by HDMI. And from my receiver to my tv. I have 2 HDMI left on my AV receiver and 4 left on my tv. What your saying is that where ever I plug my Neeo brain in those empty HDMI it will act like a network? Benny Caron Is CEC like DLNA protocole? Benny Caron You can check the web or the users manual to confirm if a specific device supports CEC. Some companies like Samsung (for example) call it Anynet + HDMI CEC. Benny Caron here is a list of CEC naming by manufacturer. Hope it helps to identify it on your device(s). BuzzLightyear Thanks a lot, I am sure that helps. Just a hint: CEC does not have to be enabled for all devices, the commands are passed through even when disabled. Benny Caron The minimum HDMI Specification that mus be available is HDMI 1.3 with this spec, the CEC was implemented into the Protocol. Liz Hauth Thanks a lot for the feedback, we are glad to hear that you like it. Liz Hauth Awesome. Very happy to hear! Besides dumb devices without descrete power on/off codes, the other pita is input selection on TV's without descrete input selection codes like most of the Philips TV's including the latest OLED models. Basically their 'smart' TV is still quite dumb... Maybe this is the wrong thread, but how does Neeo smartener handle this if I may ask? Sven De Paepe We are not yet working on specific solutions for "input-stupid" devices. This can not be handled as general as the solution for "power stupid" solutions which we have just published. This would have to be a specific handling for each and every TV, and it could even be dependent on the firmware version you have installed. Could you let me know which specific TV model you have? Then I will have the device driver team check if they have some ideas for the commands. Still nothing on belkins wemo switch? Mark Keulen We have these on the roadmap, we did delay these in favor of the stupid device handling a bit. Thanks a lot to the team this just sound like perfect ! I have a question for the community ! Do you have a great (and not too expensive) hdmi switch to recommend ? One that support 4K, CEC of course and with as many ports as possible ! Thanks in advance ! I had better go and find a spare HDMI cable and try a few things out. Will connect it straight to my AV Receiver which I assume in turn will connect Neeo to every device that is connected to? Chris Norman as long as it’s connected to any of your HDMI connected devices it will work. typically the brain will be connected to a AVR or TV. This sound GREAT! One question - how can I connect multiple devices to the NEEO brain? Will any HDMI switch do the job? Daniel Koch Exactly, HDMI has to be understood as a network. So if the involved devices support CEC, it basically doesn't matter where you plug in the NEEO Brain. However, I'm not quite sure if this would work out for me: I'm having a couple of devices connected to my Denon 1713 receiver. My digital TV box is "stupid" and is connected to my receiver. Everything else is smart and it all connects perfectly when running the TV-recipe, except the digital TV box. So how does it exactly work with NEEO? Where do I connect it via HDMI? And will it recognize the "stupid" TV box even if it's connected to the receiver? Exactly, HDMI has to be understood as a network. So if the involved devices support CEC, it basically doesn't matter where you plug in the NEEO Brain. Just posted that a second ago, hope that helps. Basically just connect the NEEO Brain to the AVR, then run the device smartener from the NEEO App for the TV Box and follow the instructions. Patrick Cheers for quick response Patrick! I'll try it out! Roger Lapuh Yes. This is one of the things I love about the planet. Thanks for being part of it! Ascanio Colonna di Paliano It's under your Device List. Tap the three dots on your stupid device and run "Device Smartener". Can I turn on the smartener for a device NEEO thinks is not stupid? In some situations my device supports individual power on/off ir commands but in my case it only supports power toggle until it's powered on. For those interested in the specifics I am using Microsoft MCE Remote receiver with a PC running Kodi (libreelec). The remote is only able to wake the pc from sleep over usb with pwr toggle, and once it has turned on the on/off ir commands work correctly. Jake Blatchford could you test by adding the power toggle to the recipe and remove the power on / off? Jake Blatchford Could you let me know which exact device you have added to NEEO? Did you add the general MCE command sets? Which exact remote do you own? I am sure we can find a solution for this one. By the way... can’t try to re-add devices because the device search isn’t working again... if I look up Panasonic or Yamaha nothing shows up. Apple TV shows Amazon Fire TV. is it me or this keeps becoming more and more unstable? Ascanio Colonna di Paliano Try a reboot of the Brain and the App. This can happen, when to many users try to access the Servers. Also there are some times outtages during Sync between the Main Database and the Server side. Markus Mahr I am throwing the towel. I have been rebooting, relaunching for hours now. No smartifier, no devices found in device search. This is just too frustrating. Back to using regular remotes, again. Ascanio Colonna di Paliano what are you trying to achieve? Do you get the stupid device screen? Ascanio Colonna di Paliano Sorry to hear your NEEO is having issues. Can you DM the NEEO host name which can be found in the about section in the app? If it's okay with you, I can have one of our devs check to see the logs if has not successfully updated. Jeff Don’t have any computer at home, only iDevices. Ascanio Colonna di Paliano the NEEO hostname can be found in the iOS App or on the remote in the about section. Ascanio Colonna di Paliano Can you download the NEEO app and access it via that method on your smartphone? What happens if you try to access the brain via a laptop browser and not smartphone browser? Jeff I have the NEEO app installed, it talks to the brain. The web interface works on a desktop. Ascanio Colonna di Paliano Can you confirm that you can successfully search and add devices via the app at this moment? Jeff as the picture shows I can’t find any of my devices. If I delete them now, I won’t be able to add them again. “Philips Hue” does give me a result. Do you want me to delete Hue Device and add it from scratch again? Ascanio Colonna di Paliano The photo that is posted is through the web browser. I am asking if you can add via the app? I want to narrow down the web interface from the app at this point to help isolate the issue. Ascanio Colonna di Paliano This is most likely linked to your user account. Can you login with a different e-mail address? This should most likely resolve the issue. Let me know. Raphael I have been trying from the app and the web interface ( the mobile screenshot is from the app! ). I created a new user account, but that didn’t fix it. it feels like the brain cached a small list of devices and doesn’t query the server. i had the same problem on my initial adding of the Yamaha amp in January. At first I could find no Yamaha device. Then only one. Then the next day I could see a multitude. Niels de Klerk can we please move on? If I say I have been using the app, I have been using the app. Do you think I am that dumb? Ascanio Colonna di Paliano To be able to resolve an issue, the supporting party needs to be absolutely sure and you don't want to base support on assumptions. So only good intentions from my side. Ascanio Colonna di Paliano As i see, you still not provide your Hostname, without the hostname, no fault can be tracked down into the Logfiles. Niels de Klerk sorry for the attitude. My flames were not directed at you. Ascanio Colonna di Paliano Once we have your hostnames I can have our devs look at the logs if that is okay with you :). Ascanio Colonna di Paliano Thanks! I have a few devs looking at your NEEO Brain as we speak :). Jeff any update on the matter? Ascanio Colonna di Paliano Nothing that I was made aware of. I know you have tried with a different account, however can you perform a data reset of your NEEO Brain and then create a new account? I understand you have tried with a different account, but I recommend this at the moment along with the data reset of the brain :). Jeff OK so. I connected the brain to Ethernet and before resetting data tried to search for devices. The search was successful. I then tried WiFi again... and the search still works ( BTW, the brain doesn’t find my 5Ghz WiFi... isn’t that supported??? ). I tried to add the TV again ( actually another model because my Panasonic TX-L32BL6E is still not in the list ), and it didn’t give me the “Stupid Device” screen. Aren’t IR-only devices stupid ( no state awareness )?? - will I have to disassemble my home every time I want to add a new device, to connect the brain to Ethernet? - is the stateless IR integration not considered “stupid device” for things such as my TV and Yamaha D-N603 MusicCast enabled receiver/amp? will report back, but I guess the data log is what you can collect directly to analyze. Jeff reset data, created another account, and.... no decides to be found, yay! This thing is really, really unstable. Ascanio Colonna di Paliano the smartifyer is for devices that do not support discrete power (On/Off) but only power toggle. Ascanio Colonna di Paliano are you blocking ports to the internet on your WiFi connection? It seems to be a local network issue the way I look at it. The devs will be back on Monday, maybe they can have a look. Niels de Klerk well that I would call super-stupid devices. Having discreet on and off IR signals does nothing towards a stateful integration of devices: they remain in fact stupid. That is depressing, given I was hoping to finally get NEEO to work in a useful way. Meh. let’s see if we manage at least to make it do what it is formally supposed to do. That would be an improvement, albeit a minor one. Niels de Klerk nope, call me crazy but I have no security setup on my router. Only thing is a fixed IP assigned to the brain based on MAC address. Was intended in case I had time to build some integration code myself, which unfortunately I don’t. i can’t see how that would interfere in any way. Ascanio Colonna di Paliano fixed addresses (dhcp reservation) is preferred. Are you providing alternative dns entries that you know off? Niels de Klerk nope, leaving it with the default DNS Server settings of the ISP. Strangely enough, haven’t had a single problem with em for years. I used to use google servers on my previous ISP. Niels de Klerk anyhow, I do in fact have some network issue. Tried resetting the ISP provided modem and everything stopped working. Will have to wait for Monday for ISP to get on it. Ascanio Colonna di Paliano hopefully it’s nothing serious. Ascanio Colonna di Paliano Thank you for the update. Please let me know if any other issues come up. NEEO only supports 2.4Ghz band. Any device with discrete power on/off commands are what we call smart devices. The new smartner feature is to address these devices and provide a much better experience. Internet is up and running. Did get access to the device search and could add my devices again. Guess this one was due to ISP. Ascanio Colonna di Paliano Thanks for the update! Raphael Patrick The Smartener does not work for the Swisscom UHD Box. The Box cannot be found via HDMI CEC. It is wired through a Onkyo AVR. (The PS4 can be controlled using CEV via the same AVR so there shoud be no wiring issue). Any suggestion?? Beni This can happen, if the swisscom box doesn't send out or receive the CEC Signal to the Bus. You can recheck if you reboot your NEEO Brain with plugged in HDMI Connection and try again, or the Box and NEEO currently don't like to talk to each other! Beni Hello! If it does not support CEC you should see the screen for "Assumption Mode". Can you confirm you are being presented this option? Jeff Yes the (not reliable) Assumption mode is working, but i want to have the discrete Power On/Off back as it was before! Beni Let me loop in Andy so he can look into this. The assumption mode also turns it on automatically as part of the recipe. You only need to "Fix" it if did not power on or power off properly. In either case, we will get on this :). Power off never worked. Please take a look at the Swisscom post. We tried to fix the power off command many times, but everybody reported that it doesn't work. If you want to have the Back button as power command, just choose the assumption mode, delete the Power toggle from the recipe steps and add BACK. To mark it as stupid and get this perfectly working with the assumption mode is for sure better then a version with discrete power commands that doesn't work at all. Thanks for understanding!